Maintaining the perfect garden or even lawn is not the easiest of tasks, especially when it's not your only one. With a job, kids, or other responsibilities, who has the time to constantly monitor current and predicted temperature, rainfall, wind and manually adjust sprinklers accordingly? Smart irrigation systems do. You can now be the envy of your neighbors and take pride in your gardening pursuits with automated systems. With modern technology, having a green thumb has never been easier. Without further ado, here are the best smart irrigation controllers to buy from the USA today. 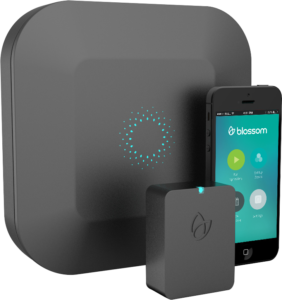 First up on our list of the best smart irrigation controllers to buy is Blossom. This self-programming device lowers your water bill by up to 30% by adjusting watering schedules based on real-time weather data. 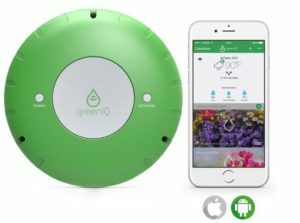 The device itself is designed for either indoor or outdoor use and also comes with a companion app, allowing you to monitor and control your sprinklers from anywhere. Blossom turns electrical outlets into internet connections making range practically limitless. The device is also capable of overseeing specified zones to adjust to a diverse ecosystem, allowing your flowers to be just as healthy as your vegetables. The instillation itself is easy and can be done in 15 minutes or less with no expertise, since it utilizes existing wiring, valves, and sprinklers. Simple, efficient, and cost effective. This is an investment you won't regret. Spruce is a 16 zone controller capable of creating independent, customizable schedules. Up to 16 moisture sensors show when and how long to water by providing real-time soil moisture data. This along with rain sensors and weather prediction allow Spruce to automatically schedule optimum watering. This smart irrigation controller will save you up to 60% of water usage compared to conventional timer-based systems. Spruce can also be integrated into your smart home by linking with other SmartThings devices. Save both time and money with this smart irrigation controller. Third on our list of the best smart irrigation controllers to buy is Rachio. This device automatically adjusts for changes in weather and seasonality specific to location, using as little water as possible. Rachio watches for upcoming weather so you don't have to and eliminates runoff by breaking watering schedules up to maximize the soil's absorption rate. Save up to 30% on outdoor water usage by installing this EPA certified irrigation system. GreenIQ is as smart and eco-friendly as the name suggests. 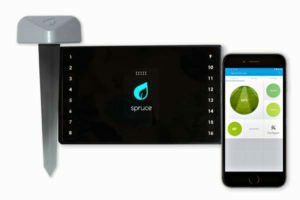 The device connects to your garden's irrigation valves and the internet via Wi-Fi or Ethernet cable with the added option to connect to your garden's lighting circuit. GreenIQ automatically downloads data from the internet on current and forecast weather conditions provided by the nearest weather station. This controller also comes with free cloud services on which system configurations and user's programs are stored and through which the garden hub and web app communicate. The web app itself allows you to access the system and create scheduling programs for each zone on the browser of any web-enabled device. 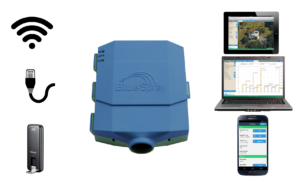 BlueSpray is an advanced and flexible irrigation scheduler that automatically adjusts to seasonal conditions. Access full calendar scheduling and detailed data such as system logs and history and water usage reports from anywhere via web browser. BlueSpray supports rain sensors, flow sensors, door sensors, and multiple Master valves, which can be configured per program or zone. The hub can turn on multiple valves simultaneously or independently for optimum functionality. This final entry on our list of the best smart irrigation controllers to buy actually comes in 3 models in the USA. The second generation RainMachine Touch HD-16 is currently the most advanced with the capability of controlling 16 independent zones. This version of the weather aware smart Wi-Fi irrigation sprinkler controller comes with a unique 6.5" ultra bright touchscreen display. 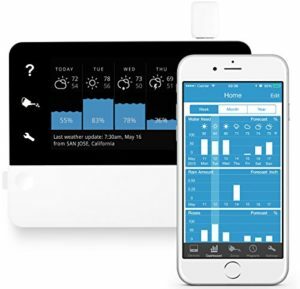 RainMachine adjusts watering time based on current weather and location based seven day forecasts. Real time temperature, wind, and rainfall data ensure that no water is wasted and freeze control and heat wave protection offer your garden the best chance at maximum health. 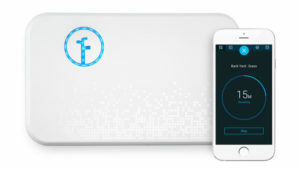 RainMachine connects via Wi-Fi and downloads this necessary data every 6 hours from satellites, radars, and thousands of weather stations. Data can be read directly on the device display or anywhere from your smart phone or tablet so that you can always be in the know. So now that you are aware of the best smart irrigation controllers to buy, why wait? Have the garden or yard that you've always wanted regardless of your location. Consider using Big Apple Buddy to have your perfect smart irrigation system delivered straight to your door from the USA. Learn more about our service or get a free shipping quote for your smart irrigation controller today!